Joyeuses Tropiques traces the plumage of a scarlet macaw. Colorful, intelligent, sometimes fluent in language. The macaws are probably among the most popular and well-known parrots. Their intensely shining plumage puts even the most colorful shirts in the shade. Their habitat are mainly the tropical forests of Brazil and the fragrance dedicated to them captures this habitat with all its wealth. The opening is full of lianas and tall trees that will form the gateway to the clearing where a splendid spectacle will soon take place. Merry chants and laughter in a firework of colors: the carnival of the parrots. Unripe tropical fruits and their leaves, harsh green determines the top note, which turns into a diffuse mixture of tropical plants. The warm tropical air condenses on the plants and dew forms on the leaves. In the base is some soil, aromatic and grassy with an appealing cocoa note. The entire vegetation of the tropical forest has been maxed out and yet the parrot spectacle doesn't really catch me. Unfortunately, the heart note doesn't really come to life on my skin and I have to smell very precisely in order to perceive something distinctive. I smell and have no opinion on this part of the fragrance. Originally, I thought I would like it the most, but it doesn't leave me satisfied. As cheerful and exotic as the scent is, it simply doesn't harmonize with me, even though it has distinctive moments. Parade du Soir traces the plumage of a blue peacock. Probably the most well-known species of peacock birds in the pheasant family remain in the memory due to the striking blue body feathers and the characteristic upper tail feathers of the roosters. The eye spots are often associated with oriental motifs or mystical representations. The evening robe of the peacock expresses itself as a spicy fruit dress. The plum is clearly perceptible, but not excessive. It embeds itself in a mixture of spices, woods and resins and thus gets the signature oriental scent. It is lightened by delicate flowers that only act in the background. Towards the end, more harsh spice tones flash through thanks to immortelle. The overall picture of the fragrance is striking and extravagant. The scent can be smelled in several fragrances already as well. However, it is also well constructed and seduces playfully with its multi-faceted feather layers. Peacocks are popular ornamental birds that beautify the royal temples, especially in Asia. And that's the way Parade du Soir needs to be seen. As a neat adornment perfect for evening hours, leaving a lasting impression. The plumage of the birds is as colorful and diverse as the biodiversity of this animal class itself. Actually, it seems obvious that one could make a line of perfume with plumage as a theme. However, this idea didn't come to my mind until I learned of Plumages by chance. The concept made me all the more curious, as it is finally a charming theme for a fragrance line again. The line of hobby ornithologist and photographer Véronique Bourgogne-Vatar starts with 5 different fragrances which shall bring the fascination for plumology closer. Blanc Ciel traces the plumage of a white dove. Bright contour feathers and soft downs form a cozy coat. The fragrance starts with a juicy fruit note, which comes across as ethereal and aqueous. The impression of fruit nectar drops symbolizes a light summer rain, which rains down on the plumage and pours entirely on this. A delicate entry that leads to a gentle powder cloud in the core, determined by mimosa. The fragrance is perfected by a creamy nest of ambrette and sandalwood. The whole scenery gives the fragrance a noticeable serenity. In fact, the dove flutters silently and sublime over the summer sky, so that its contours merge with the clouds. And it seems as if you are floating on them yourself. One feels an inner peace, always the pleasant smell in the nose, which radiates security and tender warmth. If the next shower of rain comes, it will roll off the dense plumage and protect and warm us for the duration of the shower. The fragrance is a pleasant representative of its genus, even though it can be smelled in several other scents already. The implementation, however, is very successful, because the dry, slightly sweet powder fits well with the symbol of the peace dove and arouses respect for the fragile according to this flawless appearance. Andromeda, daughter of Cassiopeia, was forced to pay for her mother's actions through no fault of her own. Since the kingdom was threatened by the flood and the sea serpent, her father sought counsel from an oracle. The only way to soothe the sea serpent was the sacrifice of Andromeda. Without further ado, she was chained to a rock and was to suffer a cruel fate. But fortunately for her, Perseus came rushing to rescue her. He demanded, however, that she should become his wife. The parents agreed, and so he beat the monster with Medusa's severed head and wanted to marry Andromeda shortly thereafter. However, as expected, Andromeda was one of those classic game balls of Greek antiquity. Originally she was promised to her uncle Phineus, who in the face of changed circumstances, reclaimed the hand of his niece and sparked a fight with his followers at the wedding. But here, too, Perseus defeated the attackers thanks to Medusa's head and petrified Phineus. 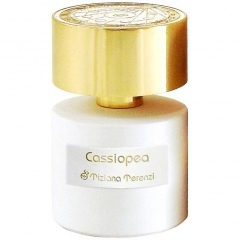 Here it is also the case that the fragrance resembles the namesake goddess. She is fresh and youthful, at first very green and immature. Moisturized by dew with an invigorating effect. She is like a tender bud that still has to blossom. She has to shape herself until she becomes what she is. At this point, in fact, still innocent and blank. The gentle lightheartedness that can do no mischief. But her possible ruin weighs in as well. The danger of the floods gnaws at her legs, but doesn't manage to devour her. Well, every plant needs water to thrive. From the bud ripens a juicy fruit that trumps the beauty of her mother and allows a positive end. With Perseus she leads a happy and long life until death. She became a better and less conceited woman. Black Tulip, in my eyes, is a very nice spring fragrance. The fragrance expresses itself in a pleasant, floral aura with dark fruit influences. Finally, a scent with plum note which is not obtrusively penetrating. A well-balanced mix of fruit and flowers that I like. It has a certain elegance, something ladyish and ends in a cozy powder base. The beautifully staged still lifes usually transport the atmosphere of the fragrances quite well. For the tulip bouquet, I think of an arrangement in a simple, transparent glass vase. Julie Massé even offers a nice chocolate accent here which I have missed for a long time in a fragrance and have missed in the past in many scents listing the fragrance note "white chocolate". It's just a touch, but it fits in well with the overall picture, which is already very discreet and cuddly. 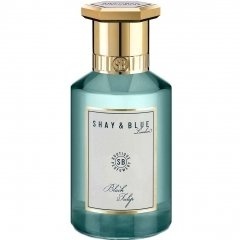 I had Shay & Blue already filed to the files, but Julie Massé succeeded again in developing a very nice scent. The second one which I find completely neat in addition to Blood Oranges. This year I have more or less deliberately renounced wearing explicit tuberose fragrances. I just needed a break because, although it is still one of my favorite flowers, I also have to be careful that I don't smell it too often. In the last few weeks, I decided to test some fragrances with a prominent tuberose note again. I was positively impressed by Tubéreuse Hédonie. While the scent of tuberose itself reveals no new facets, it is mainly the prelude with a light citrus note which contributes an innovation to me. In this combination, I have not smelled that in my test catalog of tuberose fragrances yet. Otherwise, it is a usually pleasant and floral tuberose, which is slightly fresh, but not overly sweet. It is delicate, bright and simple. All pastel colors in line with the design of packaging, flacon and advertising film. I find the fragrance therefore quite consistent and pleasant. 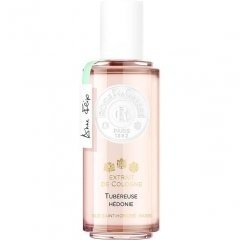 A relatively cheap alternative in comparison to other brands that Roger & Gallet presents to us. A tendentially rather light scent for spring and summer, but with the usual radiance of tuberose that lasts just as long. Chat Perché is a pleasant fragrance with slightly playful charm, just as the character of its target audience should be. "For big and small children from 3 years", says Goutal. Well, you don't have to be a child for this scent, not even a child inside. It is also suitable for adults to wear this fragrance. It starts with a pleasing freshness and a lush green reminiscent of the scent after the spring rain. The smell is very pleasant and also suitable for midsummer weather. I inevitably associate nature, spring and sunshine with it. At first, the last raindrops fall down from the sky. After the shower has passed and the sunrays slowly dry the blades of grass, the meadow flowers release a subliminally sweetish odor which fits into the course of the fragrance. Cuddly and soft as the contact of warm cat fur with the skin, the fragrance leads the wearer into a calm spring idyll. Pause, think, absorb bird chirping and insects hum, spread your blanket, get a drink from the cool box, grab a book or doze in the sun. Chat Perché may be comparatively inconspicuous and restrained, but even shy scents know how to please and find their lovers. A bittersweet citrus dips into a sea of ​​nectar and stimulates olfactory cells and papillae with its appetizing scent. Sundrunk, with its refreshing, thirst-quenching character, draws the image of a 1960s America, the Beach Boys era, Good Vibrations and Surfin' USA blast from the radio. It is midsummer and there is only one destination. The sea with wide, white sand beaches. Ice cream as much as you can eat. Fairs on the coast. Everything seems possible. 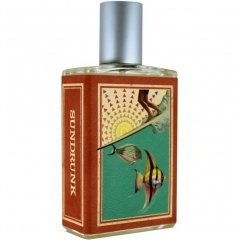 A positive, sunny mood permeates the fragrance, which is both fresh-fruity and bitter-sour. Candied orange peel as far as the nose smells. Live for the moment, best advertising for Lagnese and Co. A spray on the skin and off to vacation. The fragrance interprets the "Summer Feeling" theme completely carefree with an almost overflowing lightness. Sundrunk is: summer, sun, beach, surfing, fun, refreshment, festivals, good mood and everything else you can think of when it comes to holidays. Moth invites you on a trip to the dark side, in dusty arches where it smells bulky and of old wood. But you can quickly find a way out of the crypt, into the night. First you have to shake off the spicy dust before the tempting sweet honey smell spreads and reveals the hidden elegance of the moth. A perfect example of a successful camouflage. If you are lucky and discover it, you may consider the moth unattractive at first. And yet, some species have an appealing beauty to them that captivates and fascinates over time and is in no way inferior to the fragility and grace of butterflies. According to my taste, the spicy top note bothers me at the beginning. It is as brutal as in Civet, making me feel uncomfortable. In this case there is lots of clove, which I don't like at all. But after only a few minutes, a hint of smoke is subliminally noticeable. It gives me the impression of a slightly musty crypt, but at the same time it resembles a smokehouse somehow. So there are indeed some moths who unintentionally pulverize themselves. 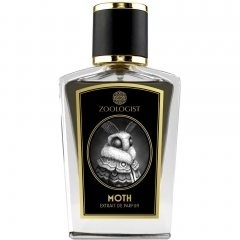 This mixture gives the fragrance a certain occult mood, but Moth is not a Gothic fragrance to me. It offers much more than just crude puns. I think that the mild honey sweetness is particularly appealing, since it is paired with a spiciness, which is now much more aromatic and pleasant. It's the attractant for the conspecifics and the nose, which are to be hypnotized. It becomes a woody powder, which in my imagination trickles down the wings of the moths as they hover silently through the night following a light source into uncertainty. What appears to be difficult at first glance becomes lovely and familiar over time. I think that Moth is easy and beautiful to wear, despite the top note, so that my purchase decision is almost made. I must also emphasize the creativity that the illustrator shows here again. The anthropomorphic version of the moth is so twisted beautiful and ingeniously chosen. Not many can wear their own body as fashion.